Trisha Wolfe has revealed the cover for the next book in the Kythan Guardians series. 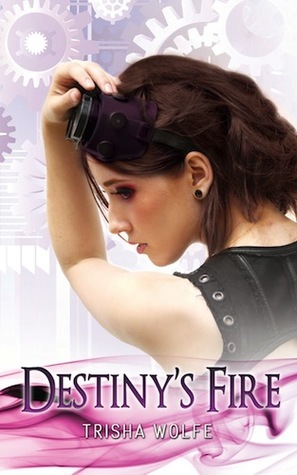 If you haven’t read Destiny’s Fire already, what are you waiting for? This book is Fabulous and it’s available for only $2.99. It's the year 2040, and sixteen-year-old Dez Harkly is one of the last of her kind—part of a nearly extinct race of shape-shifters descended from guardians to the Egyptian pharaohs. Her home and her secret are threatened when the Council lowers the barrier, allowing the enemy race to enter the Shythe haven. As the Narcolym airships approach, Dez and her friends rebel against their Council and secretly train for battle. Not only is Dez wary of war and her growing affection for her best friend Jace, she fears the change her birthday will bring. When Dez's newfound power rockets out of control, it's a Narcolym who could change her fate...if she can trust him. Dez's guarded world crumbles when she discovers why the Narcos have really come to Haven Falls, and she's forced to choose between the race who raised her and the enemy she's feared her whole life. Set against the backdrop of the Battle of Actium, in the city of Alexandria, Star struggles with her guardian duties as her feelings for the newly named pharaoh of Egypt grow deeper. Not only is Caesarian her duty, he’s the son of Cleopatra, and he’s human. All of which makes their love forbidden. But when a conspiracy linked to Caesar creeps its way into Alexandria, Star must choose between helping her fellow Kythan free themselves of their servitude, and protecting her charge—the last pharaoh—while Egypt burns around her.